It was a good weekend for Jeff Gates and his pair of 6PPCs. On Saturday, June 4, he won the Mifflin County, Pennsylvannia Ground-Hog shoot with the first-ever perfect 150/150 score–shooting at 100, 300, and 500 yards. The next day he took both First and Third Places (shooting two guns) in the Portage, PA Ground-Hog Shoot. And he did this all shooting light bullets from a 14-twist PPC–a cartridge most people think is just for ‘point-blank’ benchrest. Well Jeff proved the doubters wrong. He demonstrated that, when conditions are good, nothing beats accuracy, and nothing delivers more accuracy than a 6PPC. We asked Jeff about his choice in calibers. Jeff replied: “When I hear or read about a shooting event, the first question that always comes to mind is, ‘What was the gun and the load?’ After six years of trying various guns and calibers in a quest for ‘ultimate’ accuracy, I now have a pair of very accurate, very dependable, and very versatile 6PPC rifles. But I didn’t start as a PPC disciple. I’m a long-time off-hand shooter, but I found matches becoming few and far between, so I decided to give benchrest a try. I found several local club matches in the area and started with a heavy barrel Winchester in .222 Rem. I quickly discovered there was no factory class at many shoots. With that .222, sometimes I would compete just against custom rifles. Yes I would get clobbered but this helped me see how much I still needed to learn about shooting benchrest. I was slowly improving my gun handling, an often overlooked but VERY important area of the sport. After about three years, I had Don Clark (Hollidaysburg, PA) build me a 6BR on a trued Remington action with a Hart barrel in a McMillan benchrest stock. The 14-twist barrel shot 68gr Bergers very well. I took it to the IBS Benchrest School that year and found out that I could be somewhat competitive with many of the 6PPCs. At that point, I was in love with the 6BR cartridge. I had Don Clark build me a second 6BR very similar to the first but with a longer, heavier, 10-twist barrel set up for 90gr Berger BTHPs. That ten-twist gun was super for the 500-yard Ground-Hog matches offered here in central Pennsylvania. The 6BR was very accurate with the 90gr Bergers, and could easily hold 1″ at 300 yards. However, by the next summer I was hunting for still more accuracy and I decided to move to the 6PPC. I sold my 6BR to a fellow who promptly used it to win the first F-Class match he entered. On the advice of quite a few IBS shooters I started to look for a good used rifle. I was referred to gunsmith Bob Green from York, PA, (717-792-1069). Bob told me about a rifle he built several months before that was for sale. No money in it for Bob, but he found me a great rifle at a super price. The first match I shot a 250 with 22 “X”s. Not only did I acquire a great rifle but also an excellent benchrest gunsmith. I started using it at the 500-yard matches and found that, if the wind was decent, the little 6PPC was very competitive. I will say, if I was to build a gun exclusively for 500-yard competition, I would consider a bigger cartridge. I would probably campaign a 14-twist .243 Ackley and shoot 65-70gr match bullets at very high velocity. The Ackley would give you less hold-off, shorter flight time. As far as I’m concerned, at 500 yards, speed kills. I know this departs from conventional wisdom that says to run high-BC bullets at 500 and beyond, but that’s my take on what will work best in 500-yard Ground-Hog score matches. Compared to my previous 6BRs, I do find the 6PPC has an edge with the lighter bullets. With bullets 70gr and under, the 6PPC groups more consistently, with better accuracy. While a 6BR may be more versatile than a 6PPC (when it comes to heavy bullets), the repeatable accuracy of the 6PPC gives me confidence that I can always be competitive. The 6PPC’s consistency is the key. I find it easier to maintain a high level of accuracy with the PPC. I tell people that ‘a good day with the 6BR is an average day with the 6PPC.’ The 6BR offers more horsepower for the longer bullets, but I’ll take consistent accuracy (and velocity) over bullet weight. I am happy with the performance of both my 6PPCs and do not plan on any changes to them at this time. In moving from 6BR to 6PPC, the only change I made in my shooting style was that I shifted to free recoil. This was not so much because of the cartridge, but rather because I wanted more consistency. As far as loading goes, I’d heard the tales of how finicky the 6PPC can be, but I’ve found that my 6PPCs have been very easy to tune. I usually find there is more than one node with good accuracy. You may note that both my rifles have an Air Force emblem that says ‘Aim High’. This honors my son who is serving in the Air Force. My first PPC was smithed by Bob Green on a Stolle Panda right bolt, left port action. 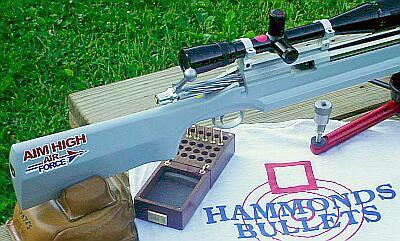 It featured a Shilen 22″ 4-groove barrel with a McMillan Edge stock with weight system. It weighed a bit over 10 pounds with a 36X B&L in Stolle rings and Jewel trigger. The stock was painted with a light gray epoxy primer. By now I had discovered all the various gadgets available in the sport. Since I had a collection of them I decided I needed a second rifle to use them on. Not looking to depart from a successful formula, I had Bob Green build me a similar Heavy Varmint class rifle. 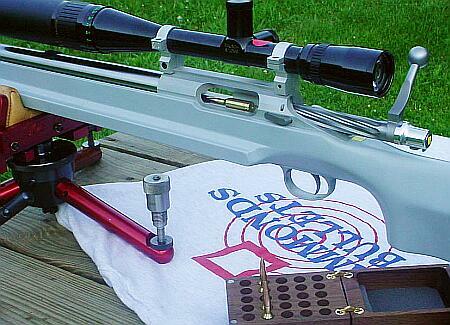 It was built on a Stolle Panda micro-port action, Jewell trigger, Edge stock with weight system, Shilen 14-twist barrel. Like my LV gun, it’s topped with a B&L 36X, a scope I’ve found very reliable. This season I switched things around. I made the Heavy Gun into a Light Gun by swapping in a Shilen 14-twist barrel and changing the weight system. I also went to single-screw Stolle rings to bring the weight down to exactly 10.0 pounds. My plan was to make this my primary IBS rifle and shoot it in both the HV and LV classes as I did not like shifting between guns at a match. (I feel it is easier to shoot one weight of gun at an IBS shoot; for Ground-Hog matches using two guns does not seem to be a problem.) On the former Light Gun, I installed a Shilen 13.5-twist heavy contour barrel, put a 12-42×56 NightForce on top, and added some weight. In this configuration, the NightForce-equipped gun is my primary Ground-Hog shoot rifle. The red windage-adjustable front rest is made in the machine shop at the Altoona Area High School Career and Technology Center. Many shooters call this the ‘Cowan Rest’. My spotter and shooting buddy Joe Cowan is the instructor for the Altoona HS program. These excellent tripod rests have been sold world-wide, with all proceeds going back to the students. This program and what the students have done with some of the money is worth a story by itself. The Cowen Rest ia a very nice design–stable and easy to adjust, and you know your money will be going into a worthy endeavor. I spent much of last summer learning to shoot free recoil. I feel free-recoiling makes me more consistent. How you handle the rifle is as important as the rifle itself. I shoot the same way at 500 yards as I do at the shorter ranges. I like to sit up high over the rifle so I can keep my body away from it. I also sit a bit to the rear, not right beside it. I feel it is easier to shoot one weight of gun at an IBS shoot and have changed to that this year. But for Ground-Hog matches, shooting two guns is fine–and it never hurts to have two chances to win. Load development for my 6PPCs has been very simple. I use the same load for all three distances at the Ground-Hog matches, 100, 300, and 500 yards. I use Clarence Hammonds’ excellent 68gr bullets in Lapua brass. All my barrels have .262″ necks. I make up my own cases and use CCI BR4 primers. Though I sometimes load hot, I’ve never pierced a primer with the CCIs. I have tried several powders, but I’ve ended up using what seems to be the standard, VV N133. With the new heavy rifle I load 53.1 clicks on a Neil Jones measure. The light rifle likes 52.1 to 52.3 clicks depending on the conditions. I seat my bullets fairly deep into the rifling, starting with a square mark and then going either direction .002 at a time until I find the sweet spot. The bullets are seated with a Wilson seater. I full-length size every time with custom FL dies Bob Green made me, one for each rifle. The day I shot the 150 (7X) score at the Mifflin County Ground-Hog Match was what I refer to as a ‘PPC Day’. Conditions showed promise early–the sky was a bit overcast with very little breeze. 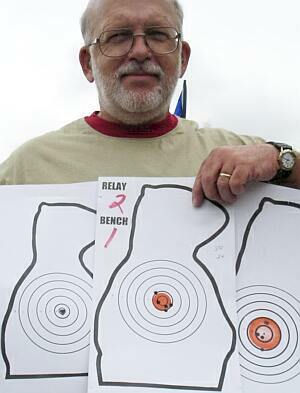 My spotter, Joe Cowan, started the relay ahead of me and shot a super 146. Then K.L. 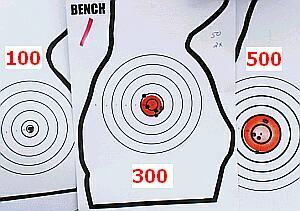 Miller on the bench next to him shot a perfect 50-5X at 500 yards. Miller’s group size was just over an inch, which may be a new range record at 500. (Yes, they were both shooting 6PPCs.) Being com-petitive, that put the pressure on me. I tried to stay focused on one shot at a time, knowing these were good conditions. Going into the 500-yard round I’d racked up 100 points with both my Light and Heavy Guns. I had dropped no points yet and had shot a great group at 100 (in the low Ones) with the Light Gun. I shot the first three shots with my Light Gun and they were all 10s. As I was about to shoot my fourth shot my spotter, Joe Cowan, told me to hold up as he had felt a little wind on his face. I waited over two minutes for the condition to change and then made two quick shots. It looked like a 50 but there was one shot a bit low. I did not want to hope for a 150 only to find out it was really a 149–but several shooters who had been watching my progress came up and assured me all shots were in the 10 Ring. Turns out my score was 150 (7x), good enough to win the match. This was the first-ever 150/150 recorded at a Mifflin Country Ground-Hog match. 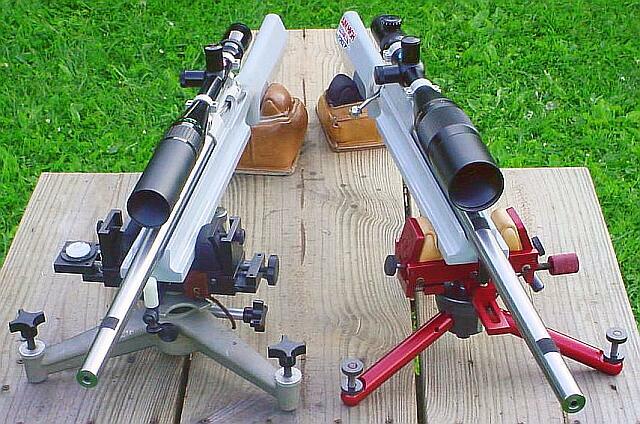 * Who says PPCs are for ‘point-blank’ benchrest only! As I was ready to shoot the Heavy Gun I realized I had lost some of my focus. My first shot went in the 10 Ring. One down and four to go. My second shot went high right out of the 10 Ring. The pressure was off and I was glad, I ended up with three shots up in the same spot. The shooter to my right had four shots go to that spot and neither of us knew why. To tell the truth at that point I did not care. I had already been vindicated in shooting a cartridge many believe to be too small for 500 yards. I am sure there will be other 150s shot. But it will always be true that a 6PPC was the first to do it at Mifflin. The next day at the South Fork Ground-Hog Shoot in Portage, PA, I took First Place with the Heavy Gun and Third Place with the Light Gun in a match with 127 competitors. It was truly a PPC kind of weekend. So far, these PPCs of mine have really performed at distances the ‘experts’ say are too far for PPCs. In April I competed in the Varmint Hunters Midwest Regional Match at the Hillsdale Gun Club in Hillsdale, Michigan, and won the custom gun class with my Heavy rifle. *One of our readers wanted us to note that the targets at the Mifflin County Ground-Hog Shoot have been modified over the years. They have evolved from the traditional black groundhog with white bull to the current outline with orange center to better spot hits and to give a better aiming point during high mirage. However, the major difference is in the 10 Ring, which has been enlarged in diameter. Obviously this has reduced the degree of difficulty. On the day Jeff shot 150/150 there were at least two 50s at 500 and some scores of 49 at 500. With the older targets, with smaller 10 Rings, that scoring would have been more difficult. Topics: PA, Pennsylvania, Mifflin, Match, 6mm, 6mm BR, 6BR, 6PPC, PPC, 6 PPC, 6.5-284, .243 Ackley, Norma, Lilja, Krieger, Shilen, 500 yards, IBS, NBRSA, Egg Shoot, Ground Hog, Varmint, Varminting, Hickory, Jewell trigger, Benchrest, BR, Bench Rest, Single-shot, competition, rifle accuracy, Norma, CCI BR4, Hodgdon Powder, Varget, Vihtavuori, N133, N540, Berger, Lapua Scenar, Bob Greene, Don Clark, Shilen, stocks, McMillan, Stolle, Kelbly, Panda, Action, stainless barrel, reloading, powder, case forming, neck-turning, .262, .271, Lapua Brass, Berger bullets, precision, Cowen Rest, Bausch & Lomb, NightForce, Hammonds, Wilson Die.